I have to admit- ever since I saw a wallpapered closet at Belle Maison, I’ve been pining away for a wallpapered closet or two of my own. And then I remembered the fabulous wallpaper-esque stenciling I’ve seen floating around (1, 2, 3, 4 for example). Paint seems so much less of a commitment than wallpaper- and the stenciling I’ve seen looks fabulous and very wallpaper-y. So when Cutting Edge Stencils offered the chance to try one of their allover stencils, I already had a project in mind. I decided to start in the guest room closet for two reasons- one, we have a whole line up of guests coming to stay this winter, so the guest room is at the top of my list. 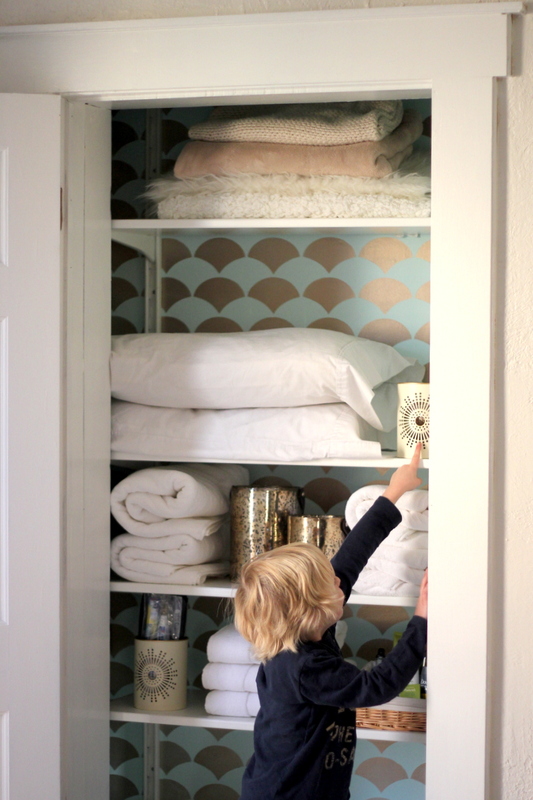 And, two, the guest room closet just doesn’t have to hold that much stuff. And look at how fabulously geometric and wallpaper-esque my guest bedroom closet looks. I love the aqua and gold. I love the rows of scallops. 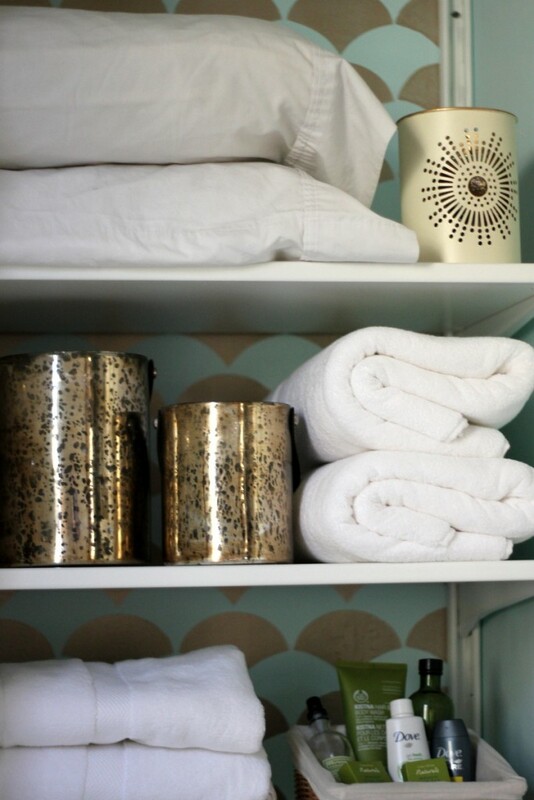 I love the organized piles of towels. The jar of dental tools is my favorite- Adam came home from work one day with these great little zippered pouches filled with a toothbrush, mini toothpaste and floss. I promptly snagged them and put in a jar for our guests. Also, I borrowed that gold framed pink quote from my desk. Cute, right? Not only do I love the finished product, I found the allover stencil from Cutting Edge really easy to use. 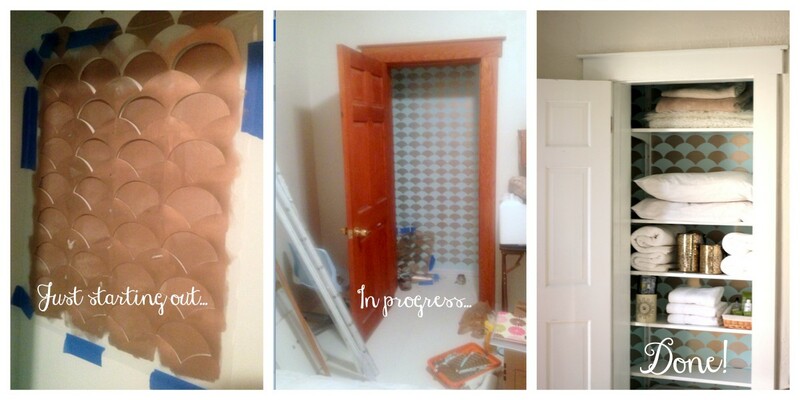 It only took me one evening to stencil the entire closet- love that. They have a great how-to video that has some fabulously helpful tips. It makes me want to stencil all of the closets. And all of the things. You too? I just finished stenciling our powder room with a cutting edge stencil and I am in love with it! I have ideas for several more stenciling projects in my future! Now I’ve got the stencil bug! This giveaway would make it so much more possible for me to do it! How cool! I love the zinnia grande flower stencil….so dramatic! I love all of the Moroccan patterned stencils! I would love to stencil a wall in my bedroom!! I really love the gold paint! I have a hall closet that could use a new look. Maybe if its pretty inside it will force me to organize it. Yikes. Beautiful stencils! We have a wall near the front door/main hallway that could become a beautiful accent wall. Thanks! I love the Anna Damask stencil. I would love to use that one on my bedroom wall. I’d love to try the Missing Link all over stencil on the shower surround in my bathroom. I’ve been wanting to stencil my kitchen table for months now! I would love the dancing butterflies for mu baby’s room! Hey Michelle- so glad you found the blog too! I love Cutting Edge stencils – I’ve used a few already, and would love to have another! Love so many of them. Verde damask is my fave so far! I’ve been wanting to do something similar with a bookshelf! Great color choices. Hmmm…. I could surely find a great place to stencil in my house (maybe the drawer fronts to my daughters dresser?). I love your color choice as well as your stenciling! 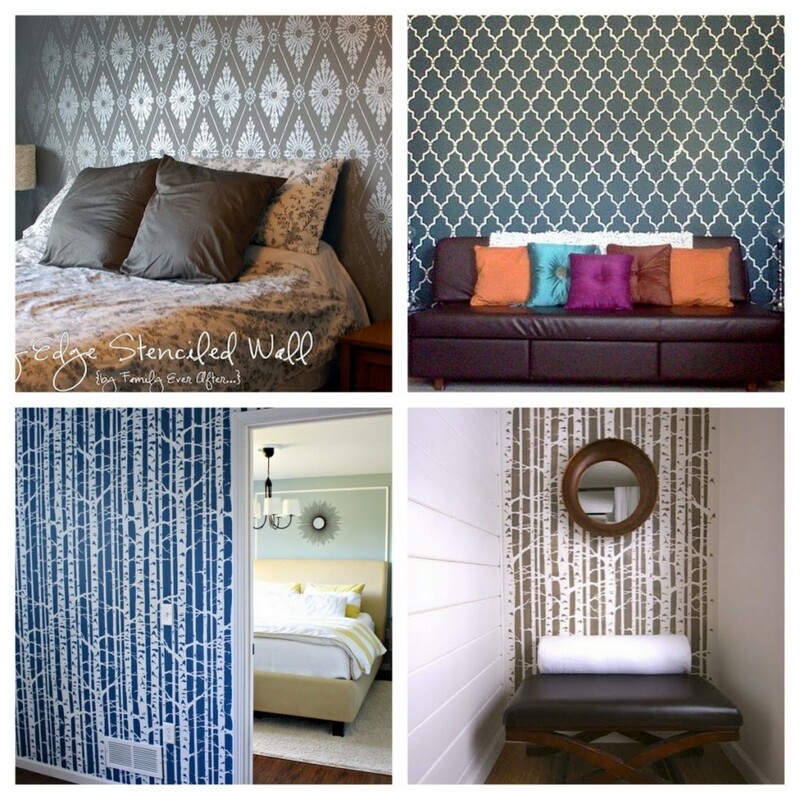 I have been looking for the look of wallpaper without the hassel of wallpaper. This looks awesome! I have been wanting a morrocan stencil for along time now! Thanks for the giveaway. wow, lots of ideas for stencils including our bedroom that really needs help! 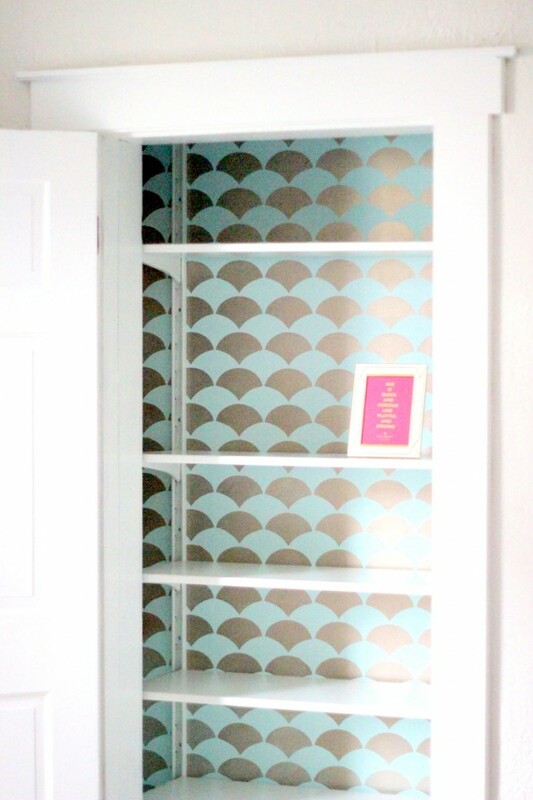 i love that you stenciled the inside of the closet! so creative. and beautiful! makes an otherwise boring spot look great. I would probably do my master bedroom. Beautiful closet! I love that idea! If I won, I would want to stencil my bathroom wall! I would choose the Anna Damask stencil! More like what would I NOT stencil. I’ve had my eye on Cutting Edge Stencils for a long time! I’m imagined the ceiling medallion in my dining room and more recently a stencil project in my daughter’s bathroom to glam it up. And now, I have to add this closet idea to the list! Great job, Kirstin! I will stencil one wall in either my living room or bedroom. I’d like to stencil our downstairs bathroom. The wallpaper is peeling and needs to go. I think a stencil on one sewing room wall would be wonderful! I’d love to try this inside a bookshelf or–if I get really brave–on a feature wall in our master bedroom! I can think of so many places in my home I’d like to try that, but I especially love the pretty decoration in a very small, unexpected place. 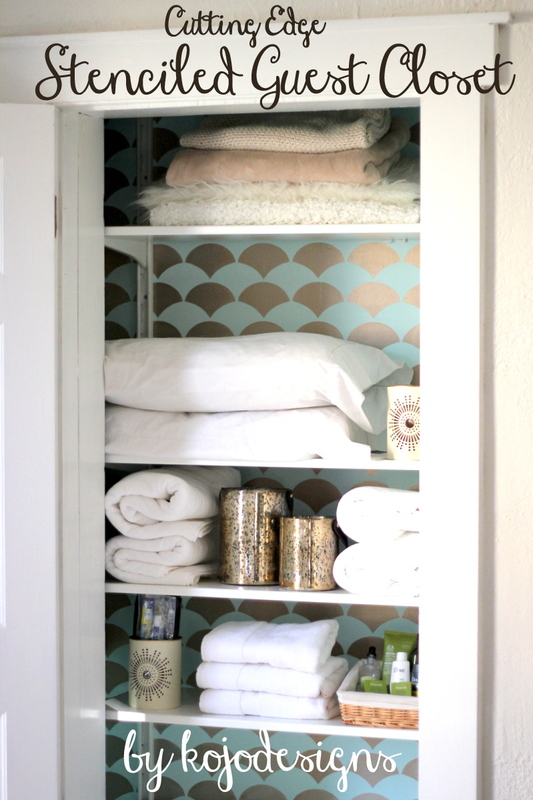 I love the idea of a stenciled closet! I think my first project would be a stenciled rug for my dining room. Oh dear, my baby boy needs to have his room stenciled with that gorgeous aspen design! Your closet looks great, btw! Ooh I’ve been eyeing these up for a while. . .I’d like to stencil an accent wall in our master bedroom. Thanks for the giveaway! That looks great! I want to stencil my bathroom! My coffee table is screaming for a makeover, and I’ve been thinking of stenciling the top of it. We are in need of a new headboard, and it would be super fun to stencil one. I would stencil one of my closets too. I have a couple that I have been needing to get to. I think this would get me going! Thanks! I love the stenciled wall look. Just got one with my entryway in mind! 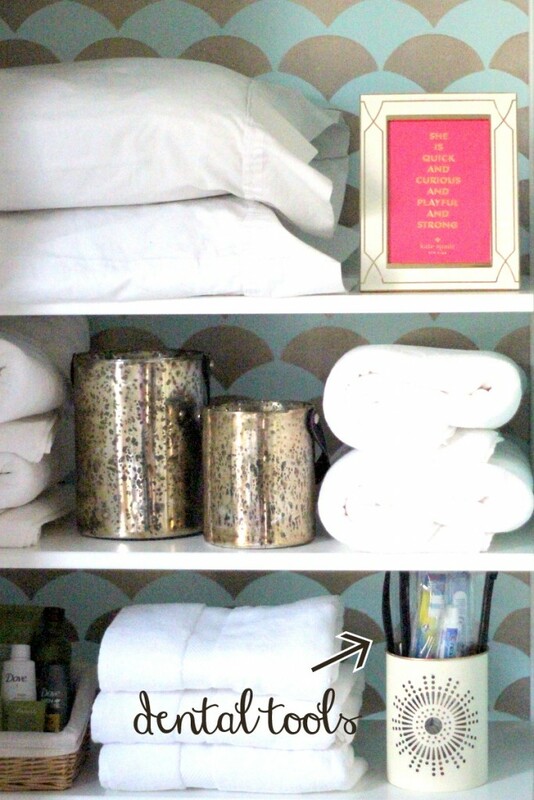 I would love the Zamira Allover stencil to use in my bathroom! I have so many friends and clients that would absolutely love this stencil!!! Already see the potential for niches, feature walls, furniture…wow!!! Moroccan or Aladdin caught my eye! I don’t know what I’d stencil yet, but we’ll be moving next summer, so hopefully I’ll have a great place to do this in our new home. 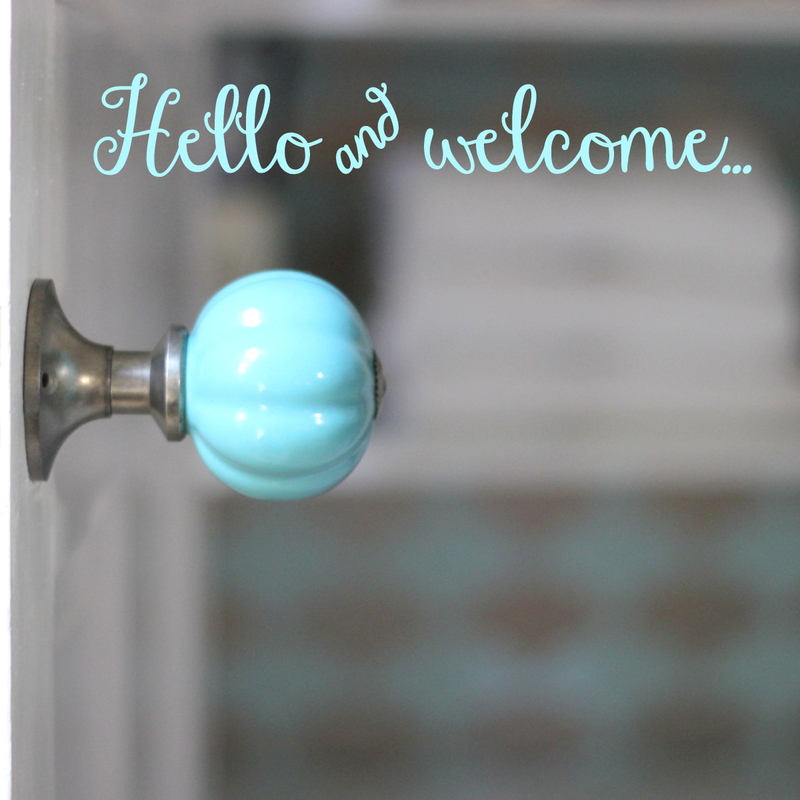 I’m redoing my bathroom – and have set a budget of $75! I bought a great Kohler mirror/medicine cabinet for $3 at a thrift shop – off to a great start!